The Frey family, Reims native and owners of some of the greatest wines of Champagne and Bordeaux, becomes the owner of Maison BINET. 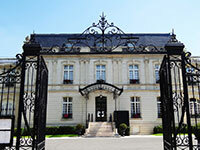 The wine cellars remain on the Natural Parc of La Montagne de Reims at Rilly-la-Montagne. At the same time… "We Are the World", song and charity single recorded by the supergroup USA for Africa, rises to the top of music charts throughout the world and becomes the fastest-selling pop single in history (March 7).